Nice update to San Fran! I really like that championship jersey for opening day! I also loved that you posted the standings so far up to the ASG. Keep up to good work! 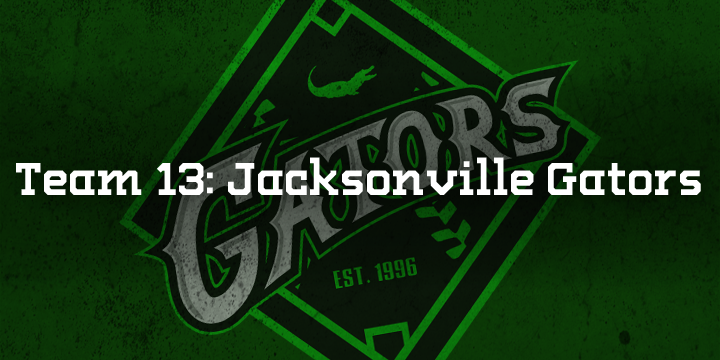 The Jacksonville Gators entered the league along with the Cyclones in 1996 and have yet to hoist the Branson Cup, but with their current roster, that may change within the next three seasons. Ricky Guerrero, the former number one draft pick, is starting to become the leader of the clubhouse as his play improves, coming off a .286 season in the three-hole paired with 24 homeruns and 32 steals. Fan favorite Clyde “The Rat” Canteria--given the name because of his questionable hairstyle--is the best offensive player on the club with a .331 average in 2014, 33 homers and 32 doubles, which earned him the Offensive POY award at shortstop. Juan Flores, the GM, has excelled in the draft which is why the Gators are poised for multiple championship runs in the next few years. Young pitchers Patrick Harrison, Terry Garza, and Perry Larson are all good examples of this, as the top three in the rotation was all drafted by Jacksonville--and under 27. For the Gators, the future is now. 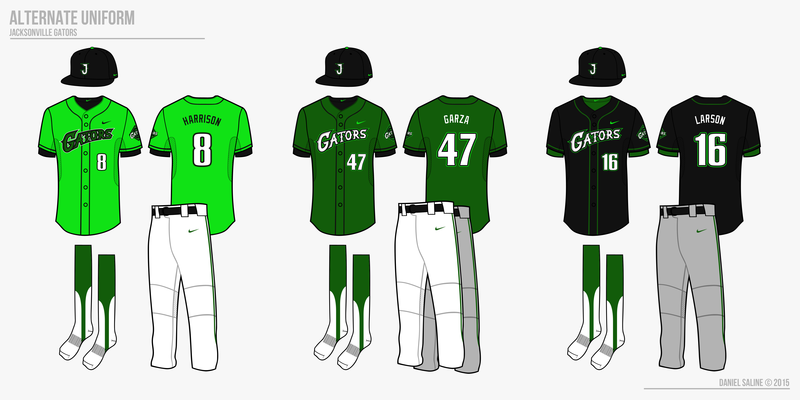 The Gators switched from their side panels--their inaugural look--to a more traditional uniform design in 2011, which earned nothing but praise from their devoted fans. 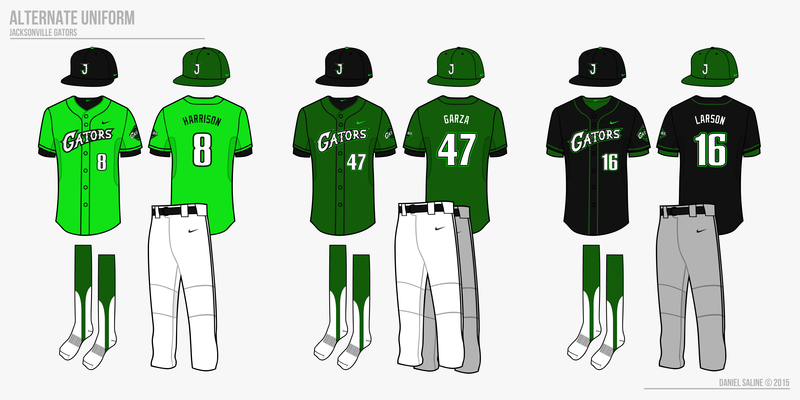 They also dropped their “J-Ville” road script and opted to have both jerseys read Gators at the request of their owner, which was seen as an upgrade. The dropshadow on the scripts remained through the redesign. Jacksonville’s primary logo resembles a baseball diamond, with the silhouette of an American Alligator above and their established date below the Gators script. 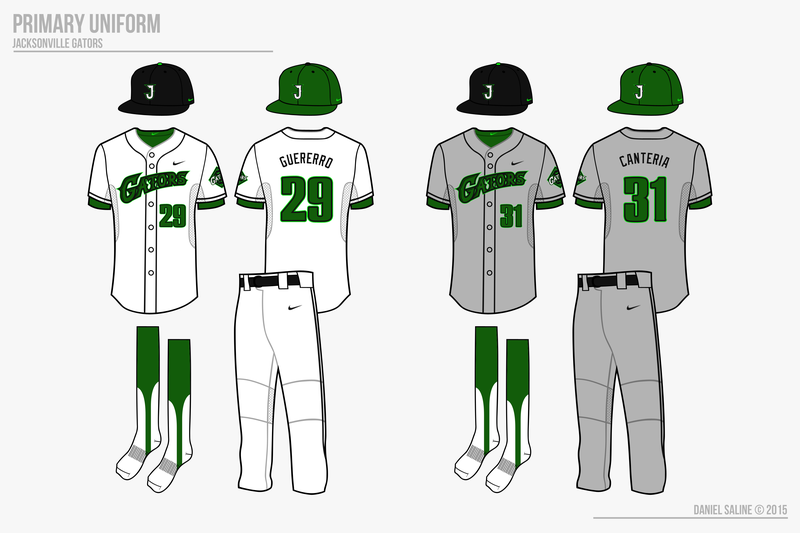 2011 also brought a lime green jersey for the J-Ville, and it quickly became a top five selling jersey in the league. The lime jersey is worn on day home games, the green jersey every Tuesday, home or road, and the black jersey on Friday nights on the road. Even with all the crazy jersey options, the Gators have one cap, and have since 1996. 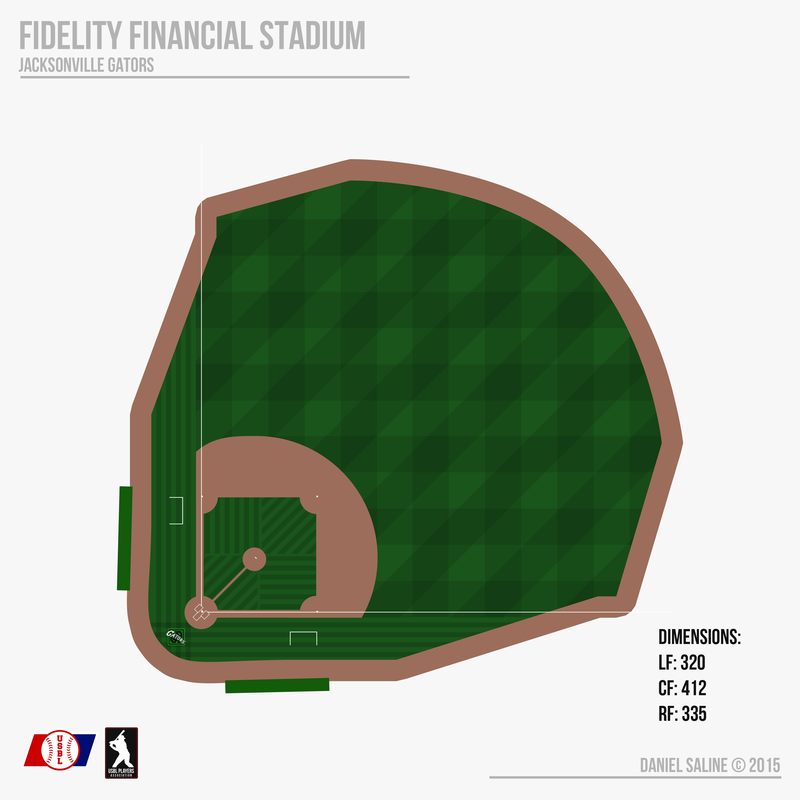 Fidelity Financial Stadium, casually known as “The Swamp” by fans in Jacksonville, is a neoclassical ballpark built in 1999 and was their first permanent home. The outfield walls are coated with ivy, a tradition the Gators are trying to claim as their own. The angular sections in the corners of the outfield have only a 3.5 foot wall, which leads to a lot more homeruns--and robbing of homeruns--than you would see in any other ballpark. The real unique feature of the stadium is the gator pond in the batters’ eye in center field which holds six American Alligators. Don’t worry, the pond is separated enough from the main concourse so that safety is not an issue. Surprisingly, no gator has been struck by a homerun ball, though John Adams, the leader in homeruns with 327, was rumored to turn batting practice into target practice in his playing days. Yeah, I know. Those are Syracuse's numbers, but I thought they meshed pretty well with the set. If you think you have a better font that isn't a proprietary, PM me and we'll discuss. Thanks, and c&c appreciated! Oregon of the USBL! I love this set. Even though it is a little flashy, it's different from the rest and that makes them stand out. One of my favorites by far! Great job! 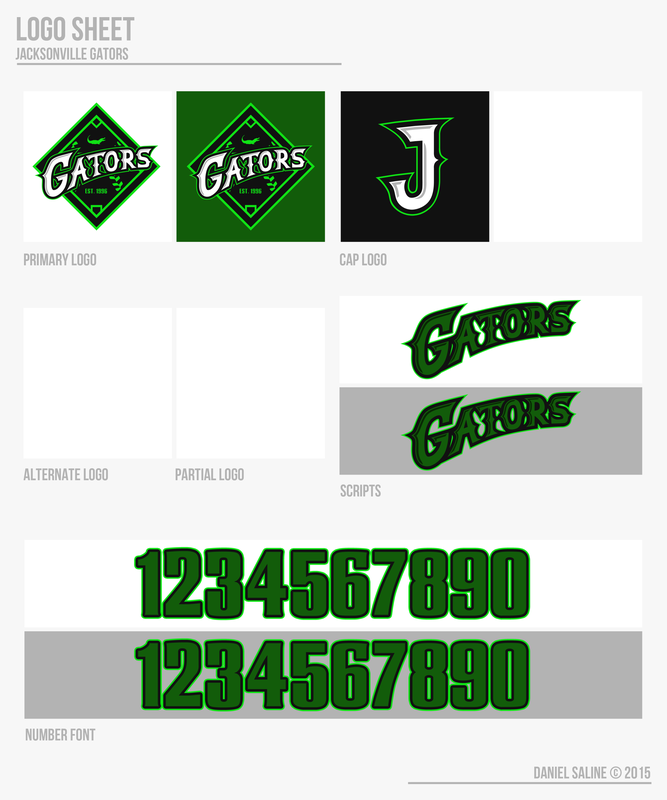 You should try an alternate logo with the diamond and the alligator silhouette Also, I think it would look better if you just put the 'GATORS' Script behind home plate instead of the whole primary logo. Finally, one thing that throws me off is the presence of a green script on three of the jerseys, but the shoulder patch has a white script. It seems a little inconsistent, maybe you can find a way to change that. Other than that, I absolutely love the color scheme! Also, they were without a permanent home for 33 years?? They were established in 1996, not 1966, so it would only be 3 years without a permanent home. That's correct. They had a hard time working with the city on finalizing a location. The city wanted downtown; the team wanted along the coast. After lengthy debate and discussion, the team threatened to relocate if nothing was completed. All of this took place during their inaugural season in '96, taking a lot of focus off of the play on the field. Ground broke in the spring of 1997 and the ballpark was ready for play two seasons later. You changed the date. I hate you. Another interesting set. 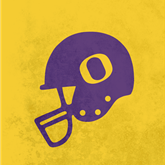 I agree that an alternate logo that emphasizes the gator would be nice. My other nitpick is that I'm not a fan of the black hat (except for the black alternate). You use almost no black in the other uniforms then put a black hat on top of it. The medium green that is their main color would work better for their hat. You should try an alternate logo with the diamond and the alligator silhouette ... I absolutely love the color scheme! I would agree wholeheartedly with this statement. The neon alternate is a bit garish, but otherwise I'm digging the whole look. Jacksonville is the best so far! Can't wait to see what you did for the Austin team! Not a bad looking set. Like others have said about the hat suggestions, I think that could work. Nice job! So I took the hat suggestion, I think it'll be a straight up mix and match for the Gators. No designated Sunday, Tuesday, Friday, Saturday business, strictly what the pitcher/team wants to do. However, when the team plays Portland/Arizona/Indiana or other green capped teams, they'll wear black caps for contrast. I changed the piping on the home and road to black, I think it balances it out better with both the green and black caps. I played around with contrasting bills, but I didn't really like the look. I really like this identity. The colors work very nicely together, and the type has a strong 90s-early 00s feel without looking dated. The addition of the dark green hat was a good moveit works much better with the primary uniforms than the black hat. 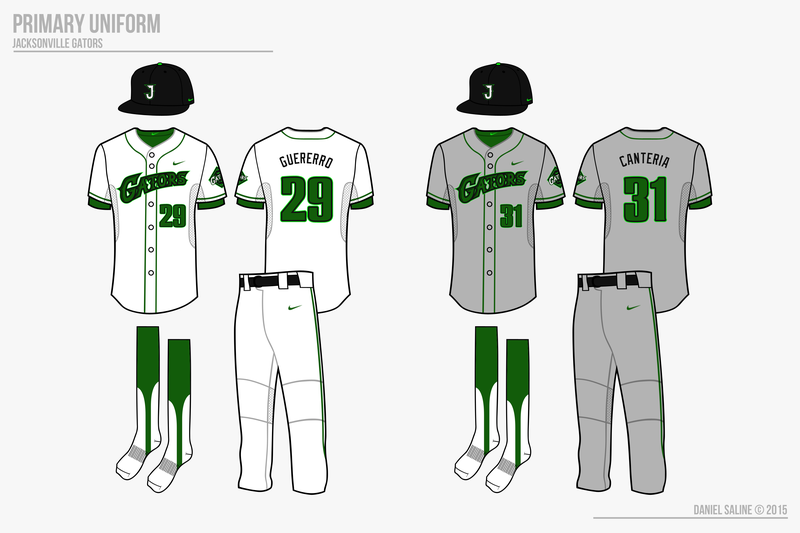 The only things I'd like to see are an alligator logo of some sort and a set of black socks to go with the black hat. I've contemplated the alligator logo, either in the diamond like rsaline said, or as a steriotypical Brandiose design with a gator holding a bat... I don't know how I feel about black socks. The black piping was meant to balance out the look, so the black cap-piping and green lettering-socks, in my opinion, give pretty good color balance.